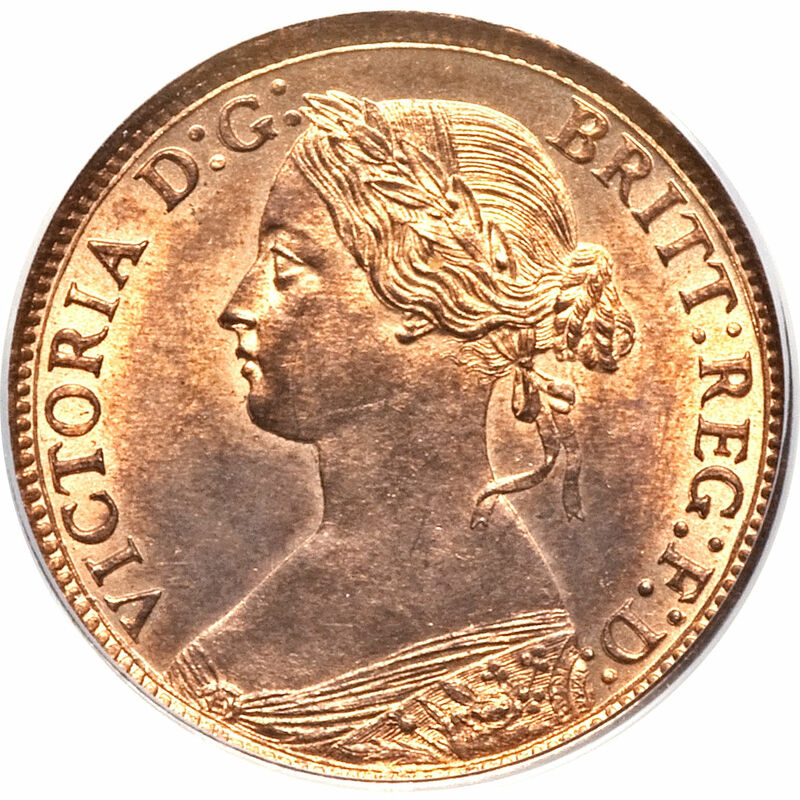 Obverse: The "Bun head" obverse features the portrait of Queen Victoria facing left, with the inscription "VICTORIA D.G. BRITT: REG: F.D." around the perimeter (Victoria by the Grace of God, Queen of Britain's, Defender of the Faith). The border consists of long teeth, and the teeth sit inside a narrow raised rim. The bronze "bun head" issue was designed by Leonard Wyon. 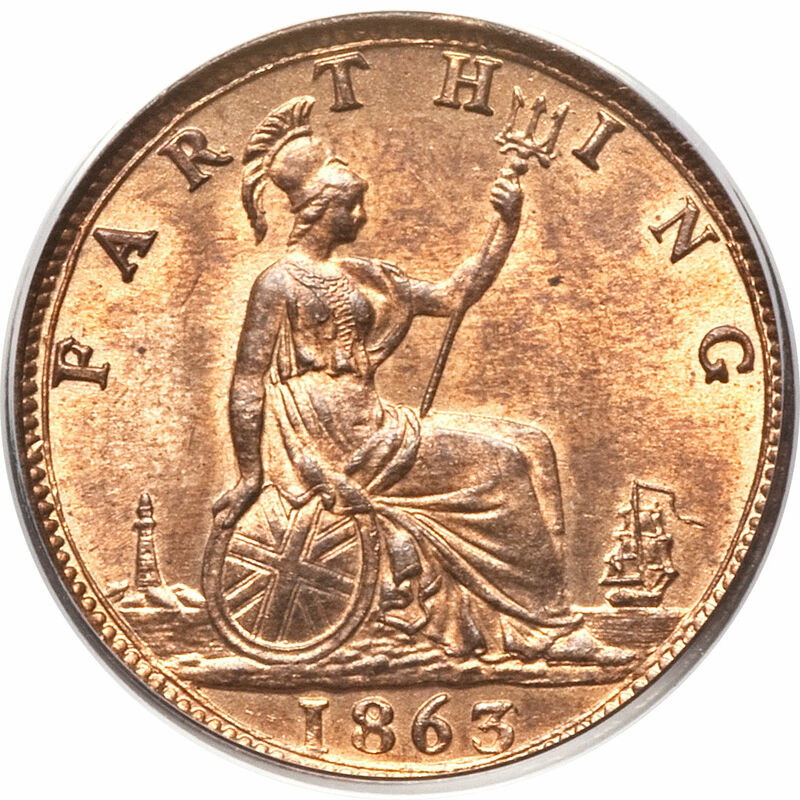 Reverse Design: Seated Britannia facing right, holding a shield and trident, a lighthouse to her left, a ship at sea to her right with the word "FARTHING" above, and the date below. H below Date: Several dates are found in this series with a "H" below the date (1874, 1875, 1876, 1881 and 1882). These coins were not minted at the Royal mint, but were produced in Birmingham by Ralph Heaton & Sons. The British farthing (¼d) coin, from "fourthing", was a unit of currency of one quarter of a penny, or one nine hundred and sixtieth of a pound sterling. It was minted in bronze, and replaced the earlier copper farthings. It was used during the reign of six monarchs: Victoria, Edward VII, George V, Edward VIII, George VI and Elizabeth II, ceasing to be legal tender in 1960. It featured two different designs on its reverse during its one hundred years in circulation: from 1860 until 1936, the image of Britannia; and from 1937 onwards, the image of a wren. Like all British coinage, it bore the portrait of the monarch on the obverse. Before Decimal Day in 1971, there were two hundred and forty pence in one pound sterling. There were four farthings in a penny, twelve pence made a shilling, and twenty shillings made a pound. Values less than a pound were usually written in terms of shillings and pence, e.g. three shillings and six pence (3/6), pronounced "three and six" or "three and sixpence". Values of less than a shilling were simply written in terms of pence, e.g. 8d, pronounced "eightpence". A price with a farthing in it would be written like this: (19/11¼), pronounced "nineteen and elevenpence farthing". As of 2013, the purchasing power of a farthing in 1960 (at its demise) ranged between 2p and 6p (in 2013 GB Pound values). 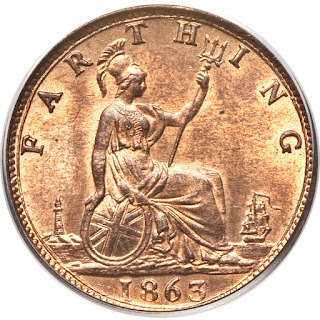 The original reverse of the coin, designed by Leonard Charles Wyon, is a seated Britannia, holding a trident, with the word FARTHING above. Issues before 1895 also feature a lighthouse to Britannia's left and a ship to her right. Various minor adjustments to the level of the sea depicted around Britannia, and the angle of her trident were also made over the years. Some issues feature toothed edges, while others feature beading. Over the years, seven different obverses were used. Edward VII, George V, George VI and Elizabeth II each had a single obverse for farthings produced during their respective reigns. Over the long reign of Queen Victoria two different obverses were used, and the short reign of Edward VIII meant that no farthings bearing his likeness were ever issued. 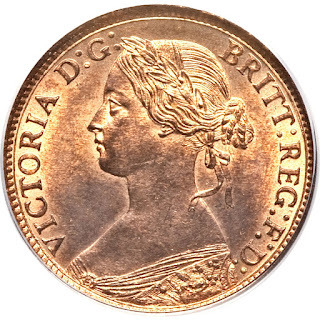 The farthing was first issued with the so-called "bun head", or "draped bust" of Queen Victoria on the obverse. The inscription around the bust read VICTORIA D G BRITT REG F D (abbreviated Latin: Victoria by the grace of God queen of Britain defender of the faith). This was replaced in 1895 by the "old head", or "veiled bust". The inscription on these coins read VICTORIA DEI GRA BRITT REGINA FID DEF IND IMP (Victoria by the grace of God queen of Britain defender of the faith empress of India). Coins issued during the reign of Edward VII feature his likeness and bear the inscription EDWARDVS VII DEI GRA BRITT OMN REX FID DEF IND IMP (Edward VII by the grace of God king of all Britain defender of the faith emperor of India). Similarly, those issued during the reign of George V feature his likeness and bear the inscription GEORGIVS V DEI GRA BRITT OMN REX FID DEF IND IMP (George V by the grace of God king of all Britain defender of the faith emperor of India). A farthing of King Edward VIII (1936) does exist, dated 1937, but technically it is a pattern coin i.e. one produced for official approval, which it would probably have been due to receive about the time that the King abdicated. The obverse shows a left-facing portrait of the king (who considered this to be his best side, and consequently broke the tradition of alternating the direction in which the monarch faces on coins — some viewed this as indicating bad luck for the reign); the inscription on the obverse is EDWARDVS VIII D G BR OMN REX F D IND IMP (Edward VIII by the grace of God king of all Britain defender of the faith emperor of India). The pattern coin of Edward VIII and regular issue farthings of George VI and Elizabeth II feature a redesigned reverse displaying the wren, one of Britain's smallest birds. George VI issue coins feature the inscription GEORGIVS VI D G BR OMN REX F D IND IMP (George VI by the grace of God king of all Britain defender of the faith emperor of India) before 1949, and GEORGIVS VI D G BR OMN REX FIDEI DEF (George VI by the grace of God king of all Britain defender of the faith) thereafter. Unlike the penny, farthings were minted throughout the early reign of Elizabeth II, bearing the inscription ELIZABETH II DEI GRA BRITT OMN REGINA F D (Elizabeth II by the grace of God queen of all Britain defender of the faith) in 1953, and ELIZABETH II DEI GRATIA REGINA F D (Elizabeth II by the grace of God queen defender of the faith) thereafter.